Finding the right software developer partners can make or break a SaaS venture. NMG offers long-term success partnerships for SaaS monetization strategy ensuring that the market goals are defined up front, targeting the service based on your goals and driving customer relationships with careful planning and execution. 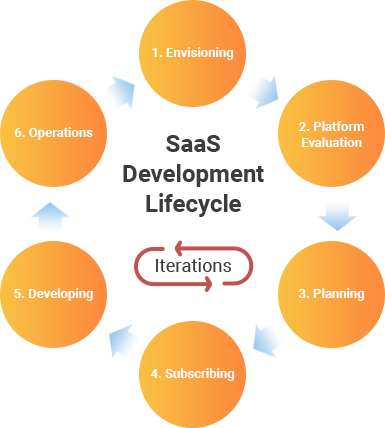 Additionally, we provide the right DevOps tools and principles in place, so the task of building and sustaining SaaS applications doesn't turn into a nightmare. SaaS integration is an on-going priority to make your current systems work together. By building web services to connect to external data services and sources, we make integration a smooth process, laying the groundwork for business users with right data integration. Quality assurance and production deployment. This phase is critical for establishing best practices around design and functional specifications and performing risk analysis that will help mitigate security and privacy issues throughout. Majority of security breaches happen at the application layer, hence SaaS app security is a primary objective we need to follow during the lifecycle. NMG codes for the most common sources of application errors such as Cross Site Scripting and SQL Injection which allows malware to attack data driven applications. SaaS security is a part of our software development process rather than reactively addressed when a security breach is detected. Considering security and privacy concerns early helps minimize the risk of schedule disruptions and reduce expense. Reducing the opportunities for attacks by employing layered defenses wherever possible. Applying a structured approach to threat scenarios during design helps us more effectively and less expensively identify risks and establish appropriate mitigations. How will you increase customer lifetime value? Tracking simple marketing metrics and converting them into custom product metrics across customer journeys. Having a deep understanding of your customer - who they are and how they engage helps you build marketing strategies which increase churn rates. NMG provides inbuilt analytics and/or integrates with existing SaaS based analytics solutions that can help you understand your customer behavior at every journey touch points. Identify and reach customers that are likely to upgrade or adopt new services based on their pages visited, feature usage, and other behavioral characteristics from google analytics. Understand what your best customers have in common – frequency of logging in, pages visited, reports downloaded etc., and identify the red flags that signal cancellation such as in-activity. Then, allocate resources such as email campaigns or videos resources for these users. Perform quick, ad hoc analysis to see who is most active, integrate A/B test tools and combine this information for building onboarding flows across your customer base. Try to stick as close as possible to the web product while bearing in mind mobile users’ needs. Just ask yourself, how will a user use your product at home, and how will he use it on the go? You’ll see that these two experiences are significantly different, and your mobile app should reflect that. Give your users reasons to use your core SaaS features on mobile apps, engaging with them to retain and encourage loyalty. A complementary SaaS mobile app aligns well with the web app but has a few extra features that the web app does not. A stand-alone app strives to accomplish everything that the web app does. The vast majority of the features that are available in the web app are also found in the mobile app. A feature-restricted app is a pared-down version of the web SaaS application. This kind of app is limited to only a few key features instead of the full functionality of the web app. Get in touch with us to learn about our SaaS Development approach and how our skills can make your products better.